This post is dedicated to my mom, lover of birds. On Saturday we took a cab from the University of Georgia campus in San Luis to the Reserva de Monteverde in the cloud forest. Our guide, a kind, humble, knowledgeable, excitable naturalist named Marcela met us there with a telescope thrown over her shoulder, binoculars around her neck, and a well-worn book of mammals, birds, and insects at her hip. In the fifteen or so minutes between arriving and entering the park, I worried we’d entered some kind of international Disney forest. Right away there were white-faced capuchin monkeys climbing and jumping about in the trees above us, and the four or five guides around us gathered their day hikers into groups and started pointing, setting up their telescopes, and spewing monkey facts in various languages. The gaggle of ecotourists followed the guides down the road away from the park where everyone blocked traffic to see a baby snake curled up on a leaf, and later, a northern emerald-toucanet eating fruit. I yearned to be away from all the people, and instead, to be wrapped in the forest, in the clouds, in silence. Luckily, after the initial frenzy outside of the park, we found what we were hoping for. The park’s trails were plenty enough that all the groups spread out in different directions and we were able to be alone with Marcela and her mind. She didn’t stop talking the first half of the hike. Marcela did a marvelous job switching back and forth between English and Spanish so that Lyon could understand everything, Josephine could benefit from the interaction, and I could learn some new vocabulary in Spanish. We are a complicated family. She has been giving tours as a naturalist in the cloud forest for twenty years, and when she says she still loves it, you have to believe her. She seemed compelled to tell us everything she knew, and she heard and saw things we didn’t. It wasn’t long before she pointed out a sloth way up high in the tree tops, and when we looked through the telescope we could see that he was hugging the branch of a sapote tree, his face pressed up against it, as if clinging for dear life, except with less urgency because, of course, he was sleeping. Further along, Marcela got out her flashlight and shone it into a hole on a dead tree trunk and pointed out the hidden tarantula, both waiting for food and hiding from predators. Want to know what one of its predators is? A wasp. A wasp that paralyzes the spider with its sting and then lays its eggs in its abdomen. When the eggs hatch, the wasplings eat the tarantula from the inside out, saving the heart for last so it will stay alive (fresh) for longer. What? But this post is about birds. And, anyways, most of our wildlife sightings were, of course, of birds. There were humming birds, jays, doves, wrens, warblers—so many birds. I knew I would never remember the names of the ones we’d seen, so we recorded them. Hit play below for a mashup of the names of all the birds we saw, recorded from the forest by me, Lyon and Marcela. And below, pictures from the internet of some of the birds we saw. 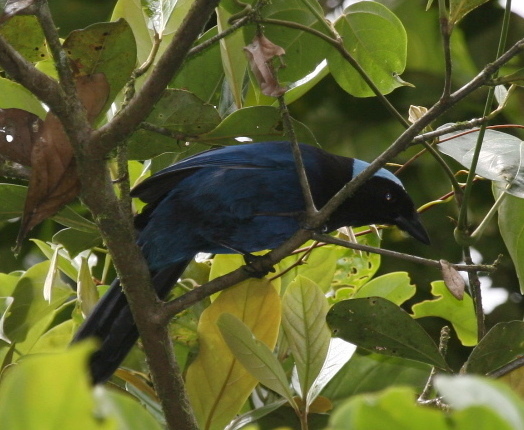 The pictures are from Wikipedia and if you click on the name of the bird you can listen to its call on Cornell’s website dedicated to neotropical birds. This is for you mom. And here’s the violet sabrewing as we saw him through the telescope. We sure heard him loud and clear. According to Marcela he was establishing his territory and letting any female sabrewings know he was there. Posted on August 21, 2018 August 22, 2018 by BilingualbabyPosted in Audio, travel, UncategorizedTagged birds, cloud forest, costa rica, nature.